Apart from all of tiling and trim progress, this hasn't been a great week. We also had a lot of plumbing angst this week. I'll spare you most of the details, but the bottom line is that our master shower faucets are costing about twice as much as we had been led to believe...and we're looking for a more dependable supplier for the rest of our hardware needs. And then there's the issue of the kitchen sink. Steve found a website that advertised our old kitchen sink, which we loved but has been discontinued. Yesterday he called Moen and confirmed that they still have some stock that they sell through their usual distributors. We placed an order online (at about three times what we paid for our first sink...but that's how much we loved it). Today he called to check on the order and learned that they don't really sell them anymore. A call to Moen confirmed that the person Steve spoke with yesterday was just making stuff up. We finally placed the rest of the plumbing fixture order today (through R's supplier, with whom we've become thoroughly disenchanted). Tomorrow we're going to some local places to explore what our other options might be. There was a little bit of lighting anguish as well. We've been putting together our lighting spreadsheet and getting prices from our lighting guy, Mark, but it wasn't until this week that we finally got a (semi-)complete write-up of our selections...and learned that our kitchen pendants have a six- to eight-week delivery time (with less than eight weeks until our expected completion date). We rushed to get the pendants ordered while we finished rounding out our lighting selections. We had one last meeting with Mark, who was very nice to tell us which fixtures he thought we should just buy at Home Depot (garage fluorescent lights, motion-detector flood lights, and CFL bulbs). We're just waiting on his final write-up of the fixtures we are getting from him, and we'll be able to go ahead and order the rest of the lighting. 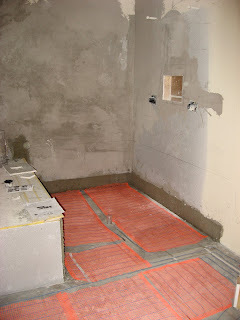 The master bath was prepared for tile. Yesterday the shower floor was built up with the proper slope to direct water to the drain (with no step down or curb from the main bathroom area), and today the radiant floor heating system was laid throughout the bathroom (that's the orange matting). 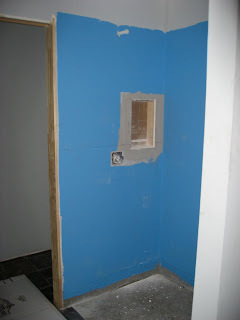 The shampoo niche was also cut into the shower wall. We're hoping the tilers are coming back tomorrow to mortar the matting into the floor and work on some more tiling. It looks like they're getting close to tiling the mudroom shower walls. 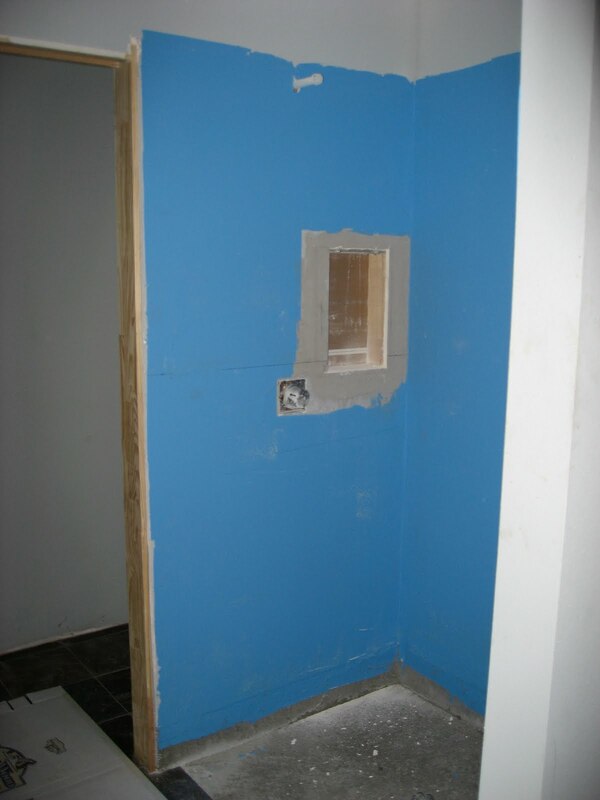 That shampoo recess was also cut, and blue waterproofing membrane was applied. The trim guys started working on the pantry shelves today. We put an electrical outlet in there so we can leave the toaster plugged in the second shelf from the bottom, and R made that shelf wider so it'll function more like a prep counter. The three shelves you see really close together aren't really that small -- the one in the middle is only a few inches wide and is intended for can storage. I'm not sure how it's going to work in practice, but this pantry is about three times as big as we're used to (and infinitely bigger than our current non-existent pantry), so I'm sure we'll make it work. 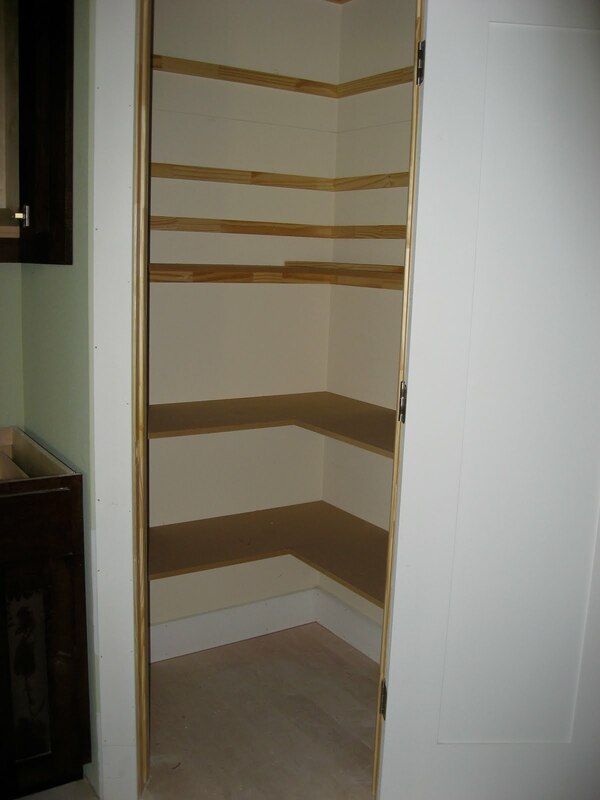 Last, we've been discussing changing the master closet layout for a few weeks, and today that was finalized. 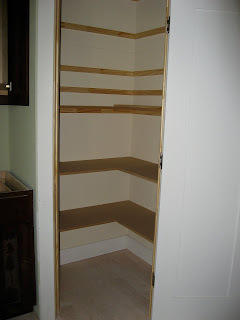 The closet is about 7'x14' and will be made up of ten bays. The first three bays on the left (the first of which is behind the door swing) will have adjustable shelves (like nice built-in bookshelves). The rest of the bays will alternate between two half-height rods with shelves above them and one full-height rod with two shelves above. 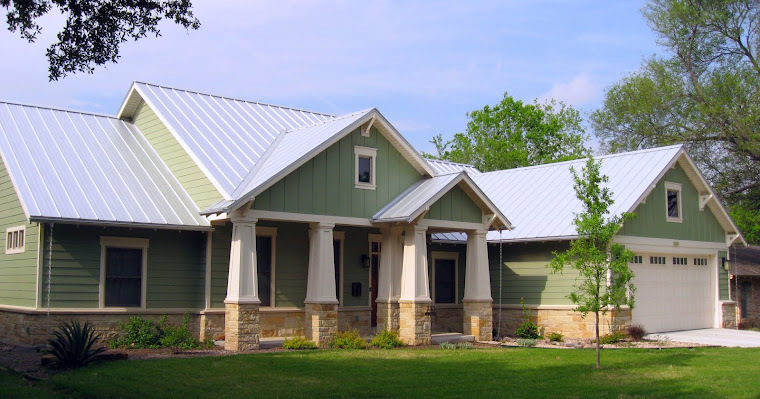 That should pretty well accommodate anything we could possibly want to hang or stack. This change was an upgrade, and not an inexpensive one, but we thought of it like buying a nice dresser (we've been storing T-shirts and things on shelves since not long after we moved to the condo). Fortunately, we're actually a good bit under on our allowances, and R agreed to let us count this change toward our cabinet allowance, which means that we won't have to pay for it until the end. Regardless, I'm feeling a bit like an ATM.